Hydraulic Energy is up to way more than the above. For usage in sewery maintenance, cleaning and so forth hydraulic powered High Pressure Water Pumps, that may be combined with injector type pumps and even sandblasting equipment is avilable. The patented construction of the pump is based on hydraulic piston-to-piston principle. This allows total freedom of rotating parts, granting great durability. Pumped water or other fluid can be taken from a natural source, reservoir or pressurised supply. 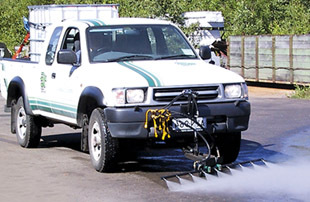 Street washing units, developed and manufactured by Dynaset, can be used with an extensive range of motor vehicles. The heart of all Street washing units is the patented hydraulic water pump. It is actuated by the original hydraulic system of a carrier machine. The extraordinary washing power of a street washing unit is based on high pressure output of the water pump and boosted by special water nozzles. Due to high pressure, water consumption, related to the treated area, is very low. High pressure water jets work as a large dozer blade, moving cleanings and mud in the desired direction. After washing, the treated area dries off almost instantly. Furthermore, low water consumption allows washing large areas very efficiently even with a small machine. The turning nozzle pipe with support wheel enables easy and reliable sweeping of cleanings and mud. Water consumption remains in less than 1 litre per m2 at pressure of 90 - 200 bar. With a spray gun attached to the mobile washing unit you can even wash and clean entrances, vehicles and other objects immediately during inspection. Hydraulic high pressure water heater (WHU) produces hot water or boiling steam, boosting the washing power of high pressure water in even the most demanding cleaning tasks. High temperature considerably intensifies the impact effect and scouring capacity of water jets in washing. 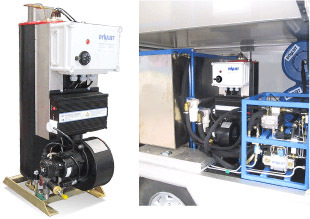 Especially intended for mobile use, the WHU unit is connected to an on-board electric system of 12 or 24 V. The heater unit is oil fired or connected to fuel system of the carriner vehicle. 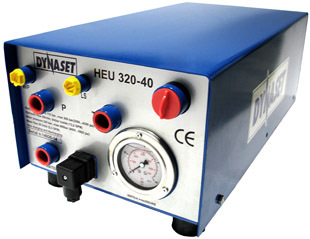 The heater unit is designed to be used in the pressure line of Dynaset hydraulic high pressure pump. 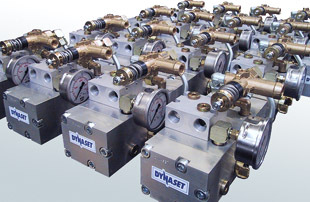 Dynaset Hydraulic pumps are designed for fast and efficient pumping of water and other liquids. Thanks to wear-resistant material of the volute and impeller, Submersible pumps are the perfect choice for pumping liquids containing solids. The simple construction of the pump ensures reliablility and easy handling in all working conditions. The hydraulic motor is located inside the pump shell to protect it against impacts. The submersible pumps can operate practically on any source of hydraulic power. 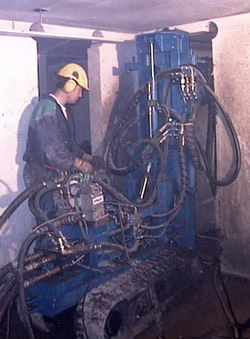 The Dynaset Drilling fluid pump is designed to suit all drilling applications. The patented pump has extraordinary output characteristics, and excellent power-to-size ratio. The pump's operation principle is based on linear reversal movement of a hydraulic piston, allowing freedom of any rotating parts. This makes the pump very reliable, durable, and cost-effective in use. Forged heavy-duty pistons with abrasion-resistant coating, self-lubricated seals and forged poppet valves run for more than a thousand hours. Thanks to high abrasion and chemical resistance of the pump, various types of drilling fluids can be used. The pumped fluid can contain up to 25 per cent solids. The sandblasting injector is an easy-to-use accessory to high pressure washing equipment with a spray gun. It boosts cleaning power greatly, but as the sand used is wet, the surroundings does not become as soiled as in normal sandblasting. The sandblasting injector suits for heavy surface cleaning tasks, paint stripping, rust removal etc. It is also very effective in graffitti removal and surface smoothing. The amount of sand injected can be adjusted easily. Sandblasting injectors are available in 200, 450 and 800 bar pressure range. The Dynaset hydraulic hose reel is designed for in-process storage and quick and safe handling of high pressure water hose. It is an essential part of professional pipe cleaning equipment. - High pressure spray gun cleaning. Unreeling the hose is convenient because of freely rotating reel when pulling the hose or feeding it into the pipe. The reel can be locked hydraulically in any position. Installating the hydraulic hose reel is easy: the reel only needs to be connected to the hydraulic circuit of a Hydraulic water pump with a flow limiter valve. The Dynaset hose reel is controlled by manual (standard) or solenoid (optional) control valve, with positions for locking, reeling and free rotation. The rotary speed of hose reel is set by adjusting hydraulic oil flow, which actuates the reel motor. Any suitable regulator, such as flow control valve, can be used for this purpose. The reeling force is pre-adjusted to 800N (corresponding pressure 50 bar). The setting can be changed by adjusting the pressure limiter valve. 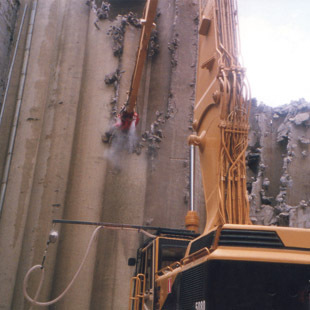 Using DYNASET dust suppression systems in demolition etc works greatly improves working efficiency and safety. The system can be applied to any type of work with significant dust emission. It is at its most efficient when used with a jaw crusher attached to a superboom excavator, but can be attached to a hammer or a drill as well. The dust suppression system is based on Dynaset hydraulic high power water pumps. Pressured water is sprayed with atomising nozzles directly at the area being treated, making the dust particles wet. This makes the falling of dust more controlled, preventing the particles to float freely. The air becomes visibly clearer and safer to breathe - even the smell and taste of dust are gone. High pressure water provided by a Dynaset hydraulic water pump combined with special water atomising nozzles gives ultimate extinguishing power. Using light and handy spray guns, even very tricky places can be reached efficiently. 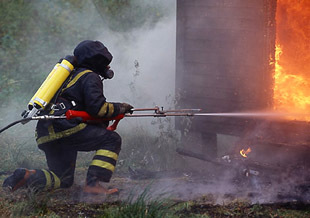 Foam can be used as the extinguishing material as well. 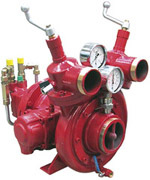 Dynaset also offers Hydraulic fire pumps, especially designed for effective and reliable use fire extinguishing. Water cutting is often a necessity in firefighting, helping to cut through obstructing structures and in revealing concealed smouldering material inside structures. In water cutting, high pressure water pump with powerful spray gun and special nozzles are being used. The Hydraulic Expansion Unit is used for reliable bolt anchoring by expanding a bolt inside a hole in a rock wall in caves, tunnels, construction sites etc. The expansion unit produces a burst of high pressure water inside the hollow and initially compressed bolt, inserted into a hole in the wall. The expanded bolt is tightly secured. The unit complies to all standards for rock bolting. The expansion unit can be installed in any mining machine. It is suitable for mechanical or manual bolting - it can be operated from a platform or from the ground. Available accessories are various mouth pieces and expanding guns. 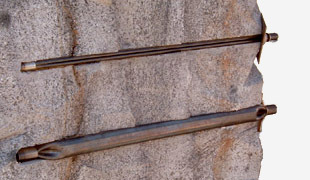 Expansion bolts before (top) and after (bottom) expansion in a solid rock wall. With patented, trouble free hydraulic pump inside and tough outer shell, the unit will be in service for a long time - even in the toughest conditions. Here we have a set of hydraulically powered centrifugal pumps for a wide range of applications. ATTENTION! Hydraulic equipment is professional equipment. The system needs to be designed according to all integrated units. Please contact us accordingly!